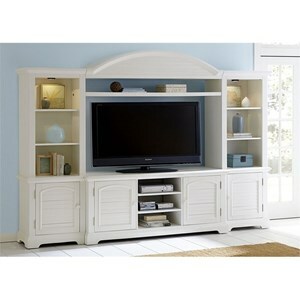 This accommodating television stand adds transitional storage space to your living room setting. Featuring two doors each concealing an adjustable shelf, the piece includes two center adjustable shelves for your electronics and other accessories. 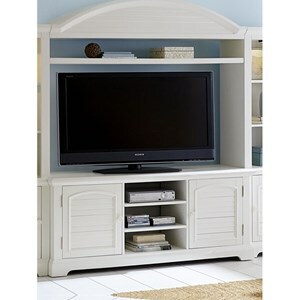 Completed with an oyster white finish, your television will fit beautifully on top of this stand. The Summer House Entertainment TV Stand with Adjustable Shelves by Liberty Furniture at Hudson's Furniture in the Tampa, St Petersburg, Orlando, Ormond Beach & Sarasota Florida area. Product availability may vary. Contact us for the most current availability on this product. Storage Two doors each concealing an adjustable shelf. Two center adjustable shelves. The Summer House collection is a great option if you are looking for furniture in the Tampa, St Petersburg, Orlando, Ormond Beach & Sarasota Florida area.